I would like to thank German Maestro for the sample, I have reviewed the GMP 8.35d before and it is an excellent headphone. These are essentially the same, but with a detachable cable so this is more of a revisit of an awesome headphone. 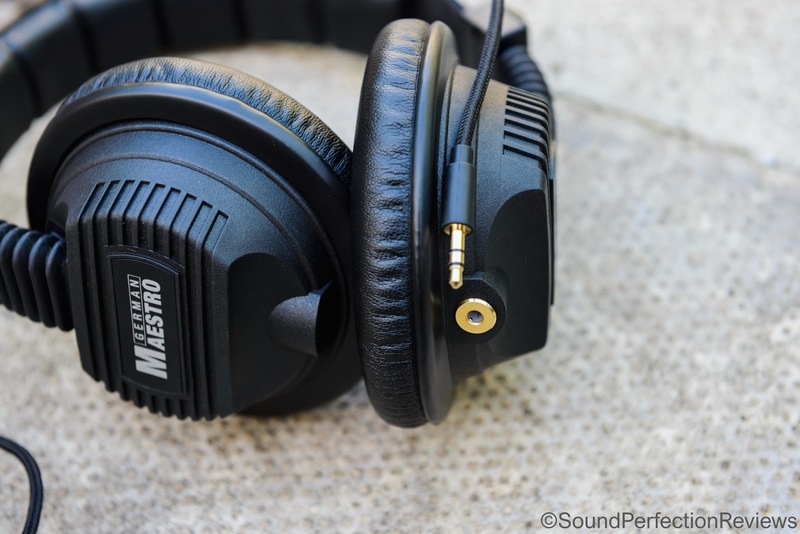 The original GMP 8.35d has a fixed, thick coiled cable, the GMP 8.35d Mobile has a detachable 3.5mm stereo jack cable, and the GMP 8.35d Mobile Advanced comes with 2 cables that are the same (one spare), along with a pair of velour pads which are my preferred pad with this headphone. Packaging, build quality and accessories: Packaging is a black box with red highlights for the information. It is more industrial looking than most because these are designed for studio and field use, not flashy walking around the street showing off. So the box is quite plain with all the information on the front and sides, they say Made in Germany in big letters also. Nothing spectacular, the headphones are held in place by a cardboard triangle. Well packaged but not eye catching, these are pure function over fashion. Build quality has been demonstrated in a video by JFB, but let’s just say you could let these get run over by a car and they should survive. They are built like tanks and now with a detachable cable they are going to last a lifetime. Accessories are not really included, only a 3.5-6.3mm adaptor. I think a small carry pouch could be included, but as these are well built you don't have to worry about putting them in a bag. 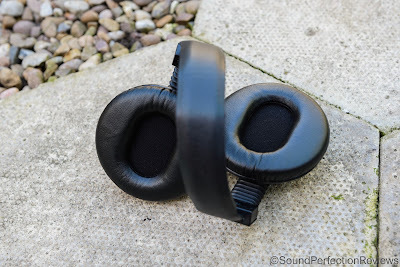 Comfort with the stock pads is average at best, they are quite shallow and are not quite fully circumaural, they don't put much pressure on your ears but they are rather thin and shallow. The headband is well padded but a little stiff, which puts some pressure on the top of your head after longer listening sessions (you can bend the headband to make it more comfortable). 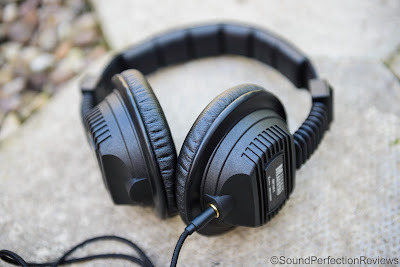 Isolation is excellent, these are closed back and do block out a lot of outside noise, obviously not on IEM level, but I use these as my go to portable headphones a lot and they block out enough for me not to be disturbed by outside noises. Now this is a quick revisit, and I am still in awe at how good these sound for the price. The sound is neutral, to a fault if you like, they offer a level of detail reserved for much higher priced models. If you don’t mind the looks, and the mediocre comfort (fixed with velours), you need to listen to believe the sound that comes out of these. The lows punch and extend effortlessly, blending into the rest of the spectrum without affecting the lower mids. They are snappy and well controlled, yet full and fun all at the same time. The mids are perfectly placed in the mix, with more detail than you’ll ever need, no nasty peaks or dips, nothing that renders male vocals better than female vocals. No harsh sibilance, just flat and detailed. The highs are excellent too, very linear with only slight drop off way up past 12kHz, the highs have plenty of detail and perfect tonality. The soundstage isn’t huge, but the separation is very good, and the centre image is very well focused. You really cannot beat these for the price if you are looking for monitors, or just a neutral and detailed headphone. 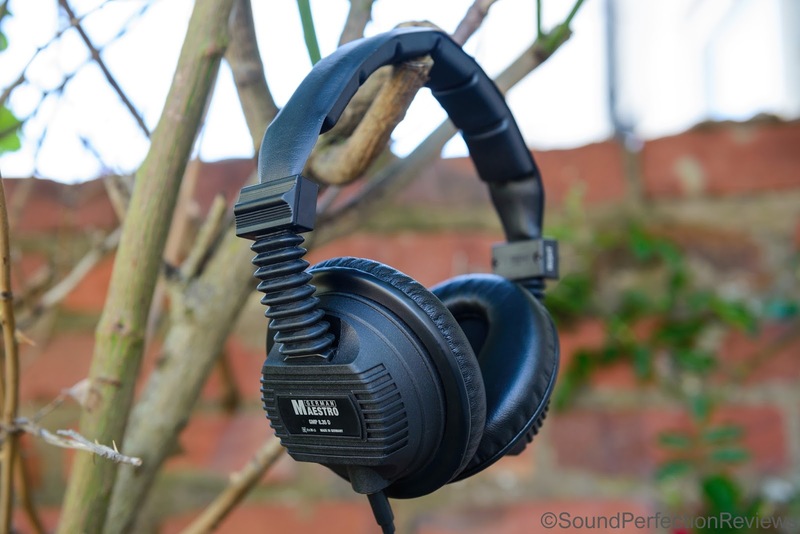 They offer the levels of detail you get from the Beyerdynamic DT1990 Pro and similar, but in a closed back and well isolating design, they don’t have the mid bass hump of the DT1770 Pro. These really do astonish me in their technical capabilities, and the build quality is insane. I recommend using the velour pads that come with the GMP 8.35d Mobile Advanced, they do take away a small amount of bass presence, but the comfort increase is well worth it if you are not too treble sensitive (you can buy the pads separately part number 41-6085). I advise anyone who is looking for a rugged, closed back headphone for any use to check these out, they work well out of a phone, or portable player, and scale up well with proper amplification. Hi, great review. Would you recommend these for home use at about 180 $ (for the advanced version with extra velour pads)? Or something else would be a better all-rounder in the sub 200$ bracket? I like good, full clear mids, and i especially like a natural timbre to voices and instruments, preferably more thick than thin. I loved the sound of the DT 770 80 ohm except that I found the mids a bit hollow and lacking in texture. I also loved the Sennheiser HD 569 for the mids, but they did sound ever so slightly unnatural and the enclosure seemed to have some resonance issues. Thank you! I listen to mostly classical, classic rock, some metal, less edm and sometimes contemporary pop-rock.